Full load and groupage services, from a team who know their way around Europe, North Africa and the Middle East. Road Freight is more than a courier service. From providing a vehicle equipped to move hanging garments, to one transporting a helicopter to Central Europe, a professional freight handler should meet all needs. They should also have management staff and drivers who are familiar with destination countries. Useful to understand local driving, or goods regulations, for efficiency and to cope with the unexpected. Dynamic provide groupage, or full load services, often for time sensitive events, or film & TV productions. The discipline they require brings effective service to all our road freight tasks. UK wide and international services are available, for export or import. Whether door to door, or depot to depot, our emphasis is on time management to make sure your schedule is met. Our packing team help ensure safe arrival, including fragile, or hazardous goods. Temperature controlled vehicles are available and specialised platforms to move any item imaginable. We will manage pre shipment inspection, destination and delivery clearance. Organise compliance needs, all customs labelling and documentation, including ATA carnets for temporary export. 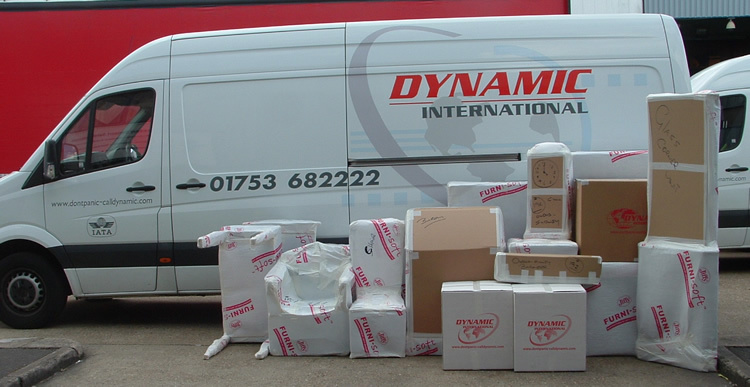 Dynamic International offer every aspect internally, from important details such as insurance, to managing your consignments at every stage. Vehicles are manned by our staff, as is a wide range of handling equipment. A professional approach is important for road freight, to achieve your objective. Our management team listen to you to understand this, offering any advice which may help. We believe every client is unique and know their goods are important to them. If working with a company who shares your aims will help, please get in touch with us at any time. Whatever your needs, they should be met. From an important UK package, to an entire film set in a remote region.